Imaginez. .Warm Climat tropical, doux sons de vagues laver à terre, des palmiers se balançant dans la brise, vues panoramiques, et l'hébergement idéal - est-il une autre façon de découvrir hawaï ?? Ce deux chambres, deux salles de bain condo vous donne tout cela et plus encore !! Récemment mis à jour avec tous les nouveaux appareils en acier inoxydable, douches de pierre, meubles mis à jour et armoires de cuisine, cette unité bien approvisionné, avec sa vue millions de dollars, vous fournira votre destination escapade parfaite! Ce charmant condo a tout ce dont vous aurez besoin pour une escapade hawaïenne inoubliable! We enjoyed our stay very much! Close to town and great beaches. The resort has security at night - very safe and secure. Great view. Great amenities. Great vacation! We loved the 180 degree ocean view and the sound of the waves. We spent most of our time on the lanai when we weren’t out and about on the island. Their kitchen was well stocked (cooking utensils, good pans, and spices) so it was easy to make meals. We didn’t even use the dining table inside the unit because we ate all our meals on the lanai while watching whales, surfers, and turtles. The eastern king bed in the master bedroom was super comfortable...like sleeping on clouds over the ocean. Loved the Ocean Waves and beautiful view. Clean condo and spectacular views of the ocean. We loved our stay and being on the island. A great place to stay for two. We enjoyed sitting on the lanai in the mornings and watching the surfers and the boats go bye. We saw wales, dolphins and sea turtles also. Parking was under the building so our car stayed cool and out of the sun. A very relaxing place. 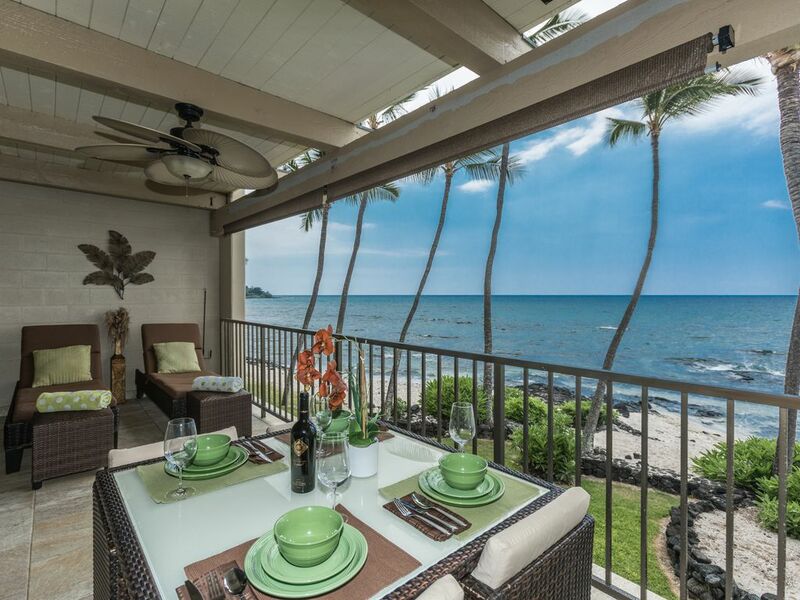 The view from the master bedroom and the lanai was magnificent. The kitchen was well stocked and the generous supply of towels was much appreciated. We were delighted with our stay. Loved the location and view. Easy access to parking, restaurants, church and harbor (scuba divers). Everything we needed, would book again!